China lashed out on Friday at “irresponsible” US accusations that Beijing was destabilizing cross-Strait relations after El Salvador cut ties with Taiwan in favour of the Asian giant. The White House also scolded the Central American country in a statement released Thursday, warning that the decision was made in a “non-transparent fashion” and affects “the economic health and security of the entire Americas region”. “The United States will continue to oppose China’s destabilization of the cross-Strait relationship and political interference in the Western Hemisphere,” the White House said. 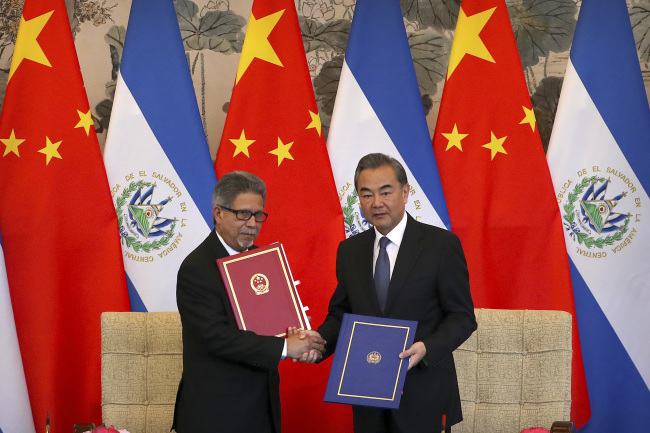 China has stepped up its poaching of Taiwan’s dwindling official allies, with El Salvador becoming the fifth diplomatic loss under Tsai’s presidency and the third this year. “Some country takes this and makes irresponsible remarks, is this not interfering in the internal affairs of El Salvador? Isn’t this, rather, politically meddling in the region? This is self-evident,” Lu told a regular press briefing. While most countries have established formal ties with Beijing rather than Taipei in recent decades, Taiwan still has unofficial relationships with powerful countries. Its most important unofficial ally is the US, which remains Taiwan’s leading arms supplier, despite switching diplomatic recognition to Beijing in 1979.